“Every Child’s Path targets key concepts required for success in both early mathematics and literacy." As a Reading Recovery teacher, I have had the privilege of working with a number of grade one children who, compared to their peers, had a great deal of difficulty learning to read and write. My training provided me with a variety of strategies to improve each child’s skill level, according to his or her learning style. I was able to find each child's best path to learning. From testing children in junior kindergarten, senior kindergarten and grade one classes, I discovered that children’s successes and difficulties in early math and literacy appeared to be linked to how well they remembered seeing information presented in a box framework. Teaching children how to interpret and remember the orientation of numbers, letters, sets, words and subsets, seen in a box framework first is key to all early learning. 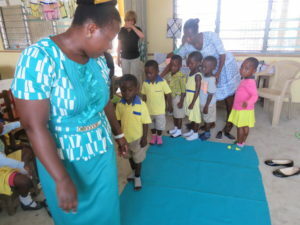 Introducing math and literacy concepts on a large mat (Noticing Mat) is an innovative, active, fun and easy way to improve children’s focusing, visualizing, critical thinking, listening and speaking skills. By assigning names to specific corners and edges of the Noticing M...at (Starting, Stopping, Top, Bottom) children have a frame of reference that provides an anchor for anything seen within this box framework, in the same way a map's numbers across the top and letters down the side help us to find and direct people to a specific place Children quickly learn the language used in this program, and apply it, with confidence, to all subject areas and testing materials.Emphasis is also placed on alphabet sounds more than letter names. Teachers who are following the program find that teaching all subjects is much easier and enjoyable. Read more Teacher Feedback. Teaching pre-school and kindergarten children how to look at print in a box framework, has resulted in fewer children needing remedial programs. Every Child's Path can be used in other ways. A child with Cerebral Palsy had great success when her Teaching Assistant used the mat to introduce related math and literacy concepts. This TA went on to create games for that child. Children with Dyslexia can benefit from walking on large letters and numbers on the Noticing Mat when they know the names of corners and edges where each starts and stop. This child finds, and touches the Starting Corner. He walks from the Starting Corner to the Stopping Corner. By naming specific corners and edges, the children have a frame of reference that becomes a link, or anchor for whatever is seen, or is to be made, inside the box. Children learn how to have a conversation about what they see on the Noticing Mat. As children walk on numbers made with wool, they talk about their direction of movement. They also tell where they are on the number, in relation to specific edges and corners. (down from the Top Edge toward the Bottom Edge). This child is tracing the beginning stroke of a letter on a vertical surface after walking on the same stroke made with wool, on the Noticing Mat. Children understand the concepts because they are so simple and sequential. They have become risk takers.